There are 2 ways you can control whether your live chat is online or offline. 1. In your Live Chat Console, you'll see a toggle called "I'm Available" in the upper right corner. If you're the only configured agent, when you go offline, the tab will go offline as well and vice versa. Be aware, for accounts with multiple agents, every agent must be offline for the chat to go offline on your site. 2. You can also control the tab availability using the Online Schedule. This is the simplest way to set up regular office hours like Monday through Friday 8 AM until 6 PM. This way, you can still receive mobile and email notifications of new chats if you're not on the website, but know that the chat will automatically go offline for the times you have scheduled. If you are using your mobile phone client like Slack or Pushover.net to chat on mobile, we suggest you change your agent settings to "Stay Available even when not logged in". This is located under Agents --> your agent, then scroll down to the notifications section. This will cause your agent to always be available. 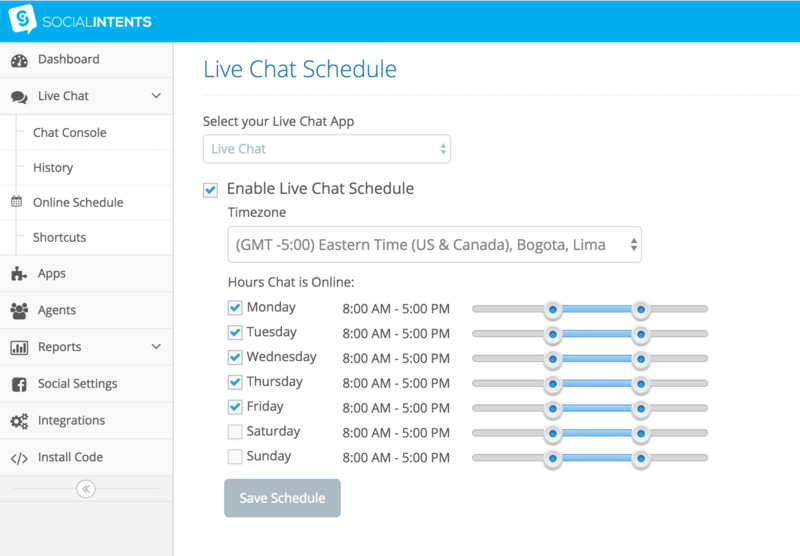 You can then use the office schedule to control whether the live chat is online or offline.